I was more than thrilled when Wal-Mart began carrying patterns and fabric again. 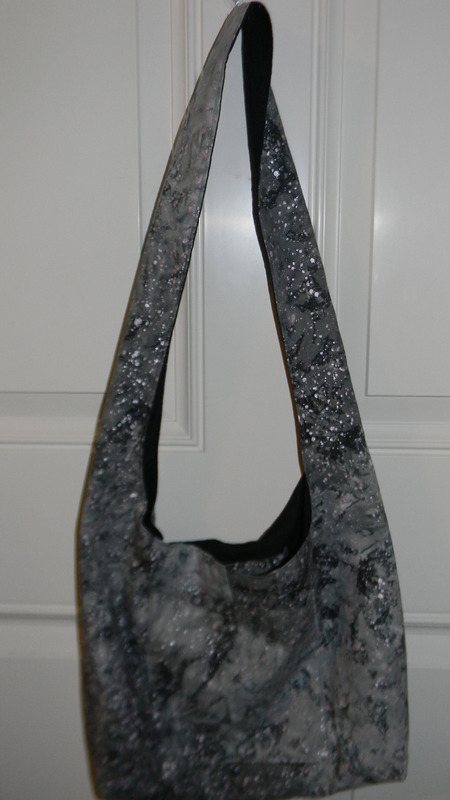 Even though they do not carry a huge section of patterns they are priced low and have some that are nice. While looking through them one day I found the Simplicity shirt pattern E1849 for $1.99. It looked like something I could wear and would like. 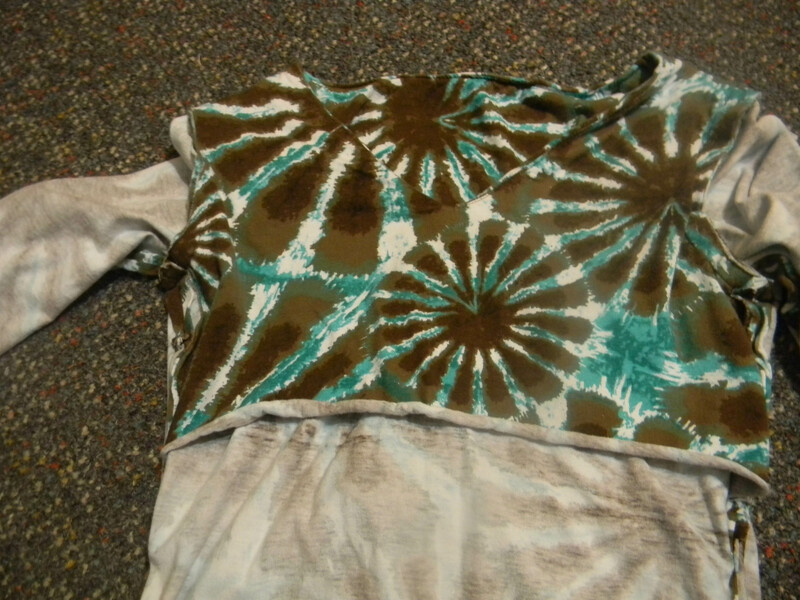 I also purchased some funky tie dyed knit fabric to make it out of. I have sewn several 18″ doll clothes patterns from Simplicity patterns and decided I really did not like the finishes they had in their patterns. This shirt pattern was no exception. I did not like that the front interfacing which is almost another full front piece. This makes the top hotter, which I don’t need in Florida, and it is does not stretch as much with 2 and sometimes 3 layers of fabric. I did not like the back facing either as it was just a small piece of fabric. 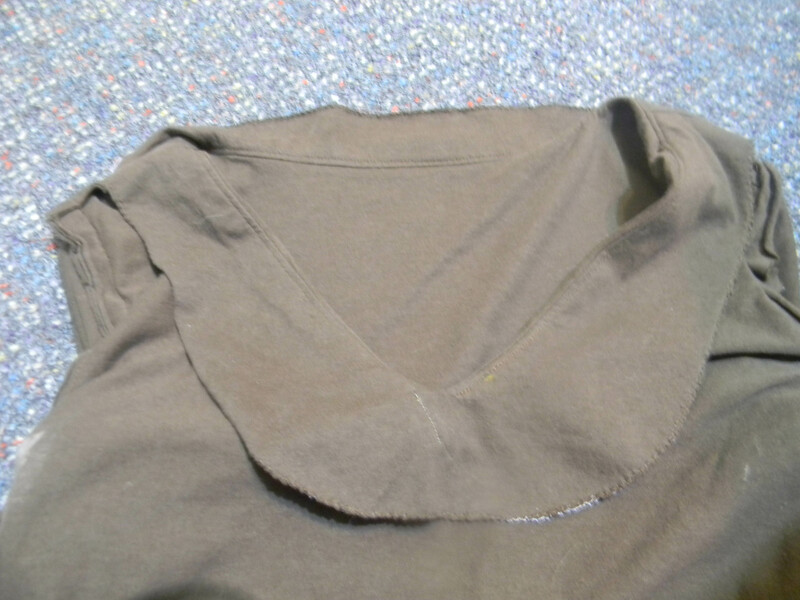 I decided when I sewed the shirt again I would create regular facings and interface them with “Pellon Fusible Easy Knit”. These are the facings in the original shirt and the alterned ones. When changing the facings you will change steps 7-9. The instructions would be to iron on interfacing to facing pieces and zig zag edges or serge. 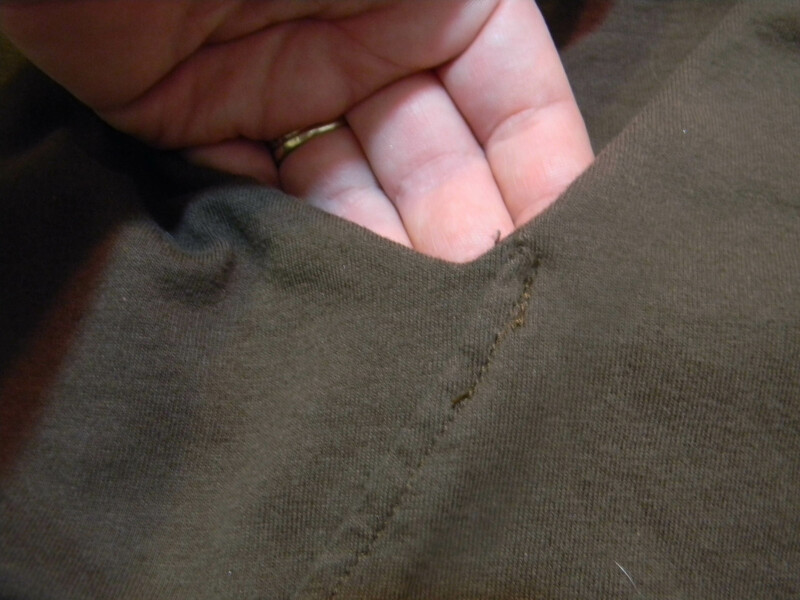 Then sew front facing to back at shoulder seams. Then pin facings to shirt. 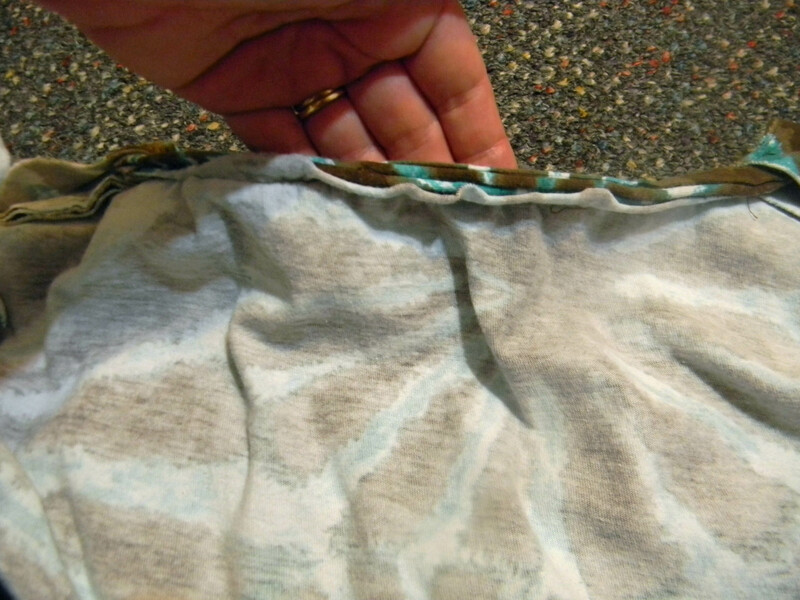 One issue you MUST watch out for in this pattern is when making sure the overlay piece is where it needs to be at the front V. I would suggest that you baste the facing first and flip to check this area before sewing. 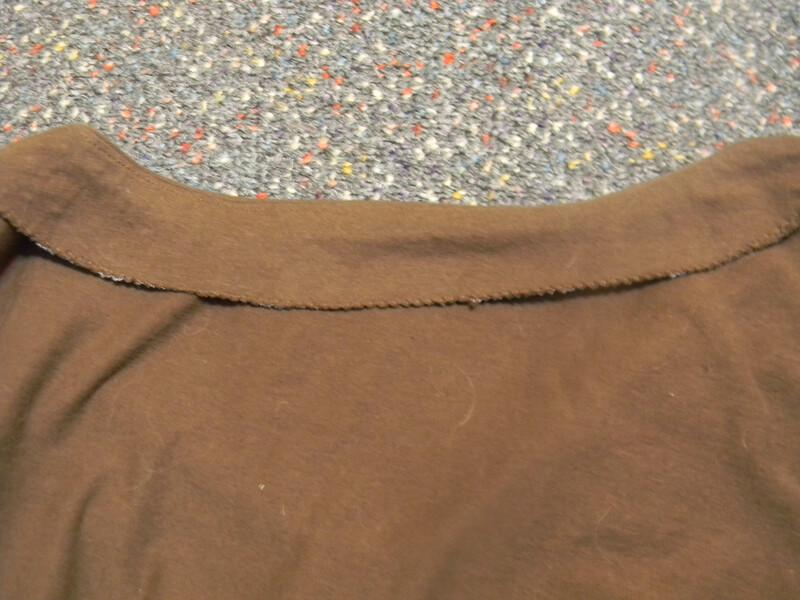 On my brown shirt I had to stitch the overlay piece down on the front because I had not placed the piece high enough. This pattern has become one of my favorite shirt patterns and I even sewed it as a birthday present for a friend (pictured above). NOTE: While looking through the Simplicity pattern book recently I found the same shirt in the Simplicity pattern 2181. This pattern has not only the above listed pattern but several other shirts. 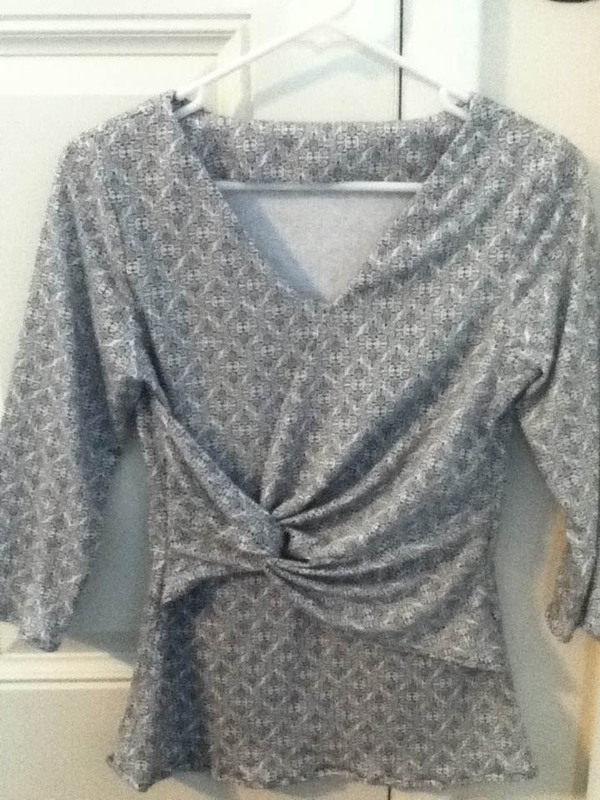 This entry was posted in Sewing and tagged knit top, pattern, sewing. Bookmark the permalink.